I'm a proud bunyip. On the weekend I completed my Permaculture Design Course and now have a Certificate in Permaculture Design. I've learned so much from the course, especially the tutors Hannah, Phil & Pete and Peter, who have a phenomenal amount of knowledge and a generous willingness to share and 're-explain' when you are a bit slow! I also learned much from other course participants who come from a wide variety of backgrounds with an enormous breadth of skills. Unlike organic gardening which just focuses on the gardening side of growing and nature, permaculture is much more holistic, designing ways of living that is sustainable and appropriate for the environment in which you live. I like permaculture as it brings the many aspects of my life together: gardening, nature, feminism, political activism and designing sustainable future. It has a very positive approach to everything and sees problems as solutions waiting to happen! Each participant had to do a design and present it in order to complete the course. A couple of class-members were very brave with rather large designs. Toni, focused on a permaculture design for the whole of Florence Park, a large park that my house backs onto. And Sarah presented a design for a community garden/orchard for her village, Blewbury. As it is the hottest part of the back garden, getting sun all year round, I knew I could do more with it to maxamize the yield of a not very large space. My design aim is to create a productive and attractive space in which I can grow some veg and also relax and chat with friends, and to include a greenhouse to use to trial a small veg plant nursery. The idea for the latter, which is my kind of little business idea, is to sell the veg plants on at the local farmers market in Spring. I've liked the idea of having my own plant nursery for a while, and earlier this year discovered that there are more people wanting to buy veg seedlings than are available. So I want to trial the idea of a veg plant nursery (which, by the way, will be with heritage varieties, not awful F1 patented we-own-your-DNA-and-the-air-you-breathe varieties) and see whether it might be a viable scheme to scale-up more professionally at a later time. With Kevin's help (because I cannot for the life of me do this kind of math and he has a Physics degree so why not tap into that skill?! 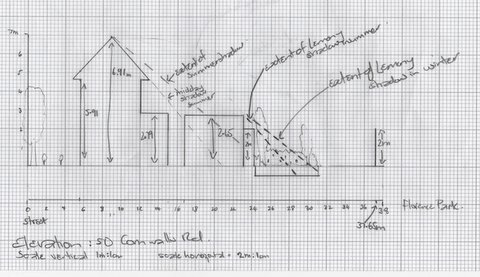 ), I also did a site elevation map. You probably cannot see the writing, but the little kind of rectangle above 'D' is a fold down seat. Fold out for sit on when enjoying the space with friends, fold down when I'm working on that bed and need to get to the middle easily. Voila! The pergola will have grape vines growing up either side of the seat in the centre. Being deciduous, these will give light to that area in winter where I'll be able to grow some winter salads, and shade and fruit in summer. 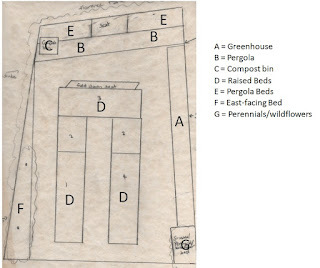 E - the east facing bed, using the principles of a forest garden, will probably have a couple of hazelnut bushes, some lower growing fruit for the middle layer, and low growing herbs such as thyme for the bottom layer. I'll be starting to work on implementing the design in January. In the first instance, I'll be using bits of planks and breeze blocks from skips to make the greenhouse shelving, and purchase some clear plastic from B&Q - this will make a temporary greenhouse. It allows me to trial it and the veg plant nursery out with minimal expense, to see how it works. The final greenhouse will be built bespoke, along with the pergola, but probably not for another year due to financial reasons (!). I am hoping to build the raised beds and paths during next year (depending on Kevin's and my time). I will go for the same type of raised beds that is in the front garden. These look good, and give some coherence to different parts of the overall garden space on our property. 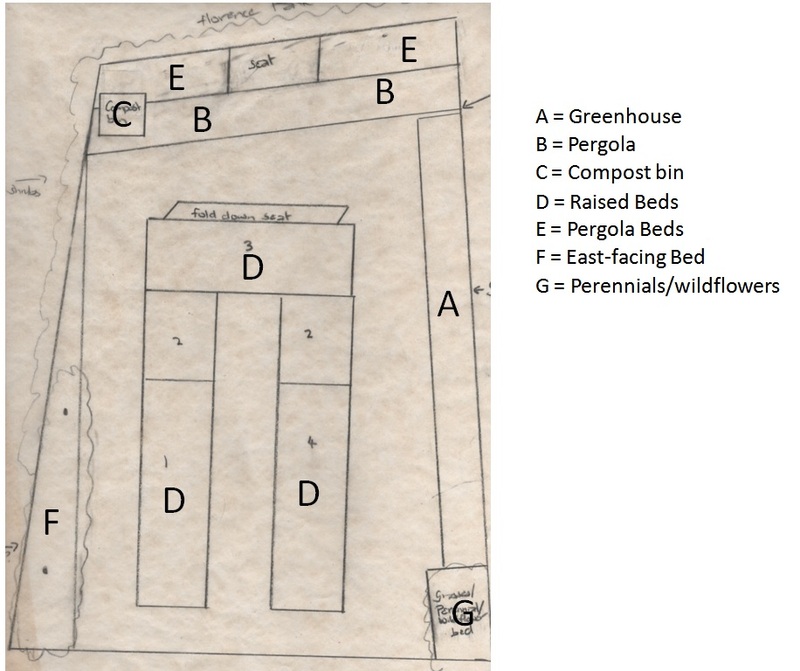 Importantly from a permaculture perspective, if the plant nursery doesn't work, it won't effect the overall design. I still want and need a greenhouse, and the bespoke greenhouse will be designed to have adjustable shelving that can be moved around. I'll be able to put tomatoes and aubergines in pots and grow them in the greenhouse, giving a longer and hotter fruiting period, and adjust the shelving so that at the plants get bigger, there will be more space for them. Another reason for holding off doing the permanent greenhouse and pergola is that we also need to repair or replace the fence, and it of course makes sense to do that before building these two permanent items. The raised bed in the middle and the paths are not dependent on the state of the fence. And that's what the course taught me. The incredibly useful value of carefully studying your site over time, thinking about every element to be considered and resources available, so that you implement a well thought-out design that is practical, sustainable, and beautiful. So yep, I'm a happy bunyip. Got my design, got my certificate, got a well-rounded outlook to go forward with. It's all good. What's up, always i used to check weblog posts here early in the break of day, since i love to find out more and more. my letter did get published!